The problem Plastic watch crystals scratch very easily with the result that they soon look unattractive. Re-placement of the crystal is not normally possible, especially where watches have plastic cases. The solution Watch owners the world over suffer from this sort of problem, but now polyWatch, a new type of special-purpose polishing paste, offers them an extraordinarily simple solution. For the first time, consumers can remove scratches rapidly and cheaply from their plastic watch crystal by carrying out an easy-to-follow "do-it-yourself" procedure. How to use it Apply polyWatch to the watch crystal. Polish the scratched areas for 2-3 minutes with great pressure at a right angle to the scratches, using a piece of cotton wool. Deep scratches need to be treated more than once. Finally, remove any remaining polyWatch with a cloth. The tube contents of 5 ml is sufficient for approximately 10-12 applications. How it works The plastic crystal is very slightly dissolved and ground down by tiny abrasive particles. The edges of the scratch marks are then smoothed off and the cracks filled in with some of the original plastic from the watch crystal. PolyWatch tube with a radom color cloth. 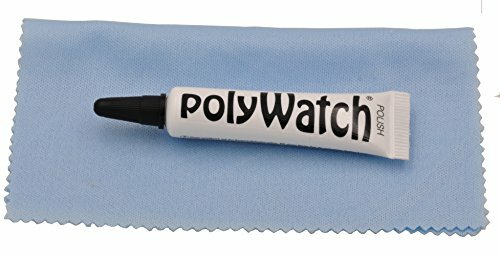 PolyWatch scratch remover polish tube with cloth. If you have any questions about this product by Polywatch, contact us by completing and submitting the form below. If you are looking for a specif part number, please include it with your message.